East Side seventh-graders Graden Strang, left, and Katie Hoskins, right, will represent Cannon County at the Tennessee State Spelling Bee, March 2, at Belmont. Hoskins won the event and Strang finished runner-up. 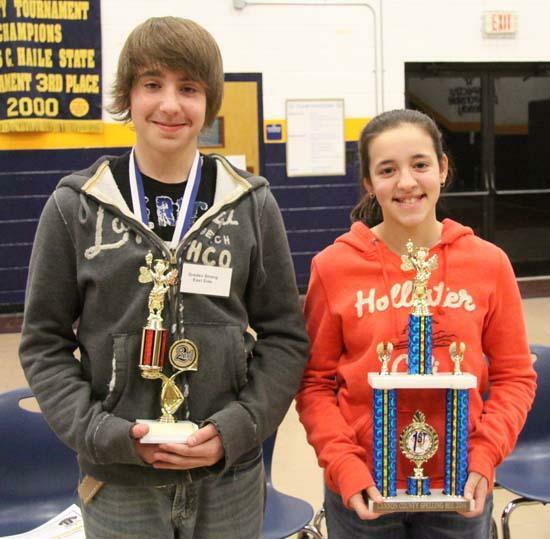 Katie Hoskins was hoping for a rematch with her older brother, Jake, in the finals of the 2011 Cannon County Spelling Bee, held at East Side Elementary School Thursday (Feb. 3). Katie Hoskins did not get the showdown she anticipated but the thriving East Side seventh-grader did get the favorable result she wanted after successfully spelling temporal. She beat out Graden Strang, also a seventh-grader at East Side, who fell from victory after misspelling angelic. Hoskins will represent Cannon County, along with Strang, in the Tennessee State Spelling Bee at Belmont University, March 2. Katie Hoskins finished runner-up in 2010 when Jake Hoskins edged her out for the top spot. The Hoskins appeared well on their way to a repeat showdown this year when they were among the three finalists, along with Strang. By the third round of the Cannon County Spelling Bee, 21 of the 24 students participating had been eliminated. Jake Hoskins went out in what had to be considered a mild upset following the third round, leaving Katie Hoskins and Strang to battle for county spelling supremacy. The classmates battled back and forth, word for word, through seven rounds before Strang finally stumbled. Per spelling bee rules, Katie Hoskins still had to spell her word correctly in the eighth round in order to win – which she did. Had Hoskins slipped, then she and Strang would have continued. Students from Cannon County’s six elementary schools who finished in the top five of their respective school’s Spelling Bee were eligible to participate in the County-wide Spelling Bee. Of the 30 eligible students, 24 participated. Way to go Katie...So proud of you.